Biography: Determined to go into business after spotting a gap in the market but turned down by the banks in 1998, Emma risked everything to get UK Container Maintenance (UKCM) off the ground by putting the start-up costs on credit cards. In 2018, UKCM, based in Cheshire, now turns over £6 million per annum and employs over 60 people. It is committed to the refurbishment, restoration and reuse of waste containers, Emma’s vision has seen the company refurbish over 80,000 containers per annum. 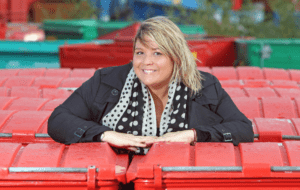 Emma has become a UK-leading voice in the waste and manufacturing industry, trailblazing a path for woman in the often male-dominated industry. Her determination to succeed in business has been carefully balanced with her deep understanding and empathy for those in need and those scared to take that first leap into business. Emma now invests in other businesses and acts as a mentor. Emma’s exemplary business acumen and passion has been recognised on numerous occasions, in 2015 Emma was awarded an MBE in the New Year Honours List.